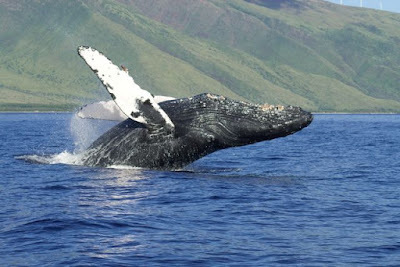 Gotta love whale season around here in Hawaii. Each year I go out a few times on the boats to shoot whales. This last trip was the best ever. As always, I go on Safari Boat Excursions. This trip Captain Dave had found a competition pod of 8 whales. That would be 1 female and 7 males. This was the most active group I have seen in any of my previous trips on the water. We saw a total of 11 breaches and we saw 2 whales breach at the same time. There was one that kept sticking his head out of the water and bumping the others. The female was definitely enjoying the attention. She would run for a bit. She stopped and rolled around in place. There was so much activity, it was overwhelming. During our travel time to between the harbor and the whale pod, we crossed paths with a mom and baby. The naturalist on board stated that the young one was an estimated week or so old, at most. We could see that the baby was very pale, a sign of newness. We took a short moment to watch the newborn, but moved on to give it the space it needed. Once again, I can not say enough about Captain Dave and his great boat company. Thanks for the ride!